Willowdale is an established community in the former City of North York, now part of Toronto, Ontario, Canada. It was originally a village centred at the intersection of Willowdale Avenue and Sheppard Avenue East, where a number of small business and commercial buildings still remain. 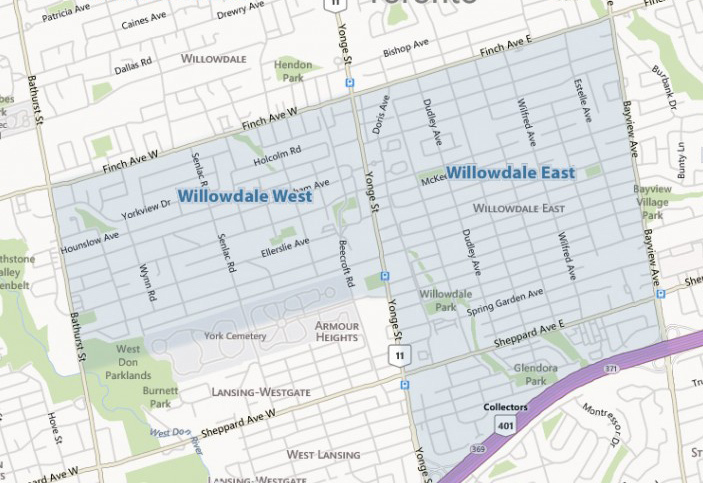 The Willowdale neighbourhood extends east to Bayview Avenue, west to Bathurst Street, south to Highway 401, and north to Steeles Avenue. The neighbourhood abuts Bayview Village to the east and is considered to overlap Newtonbrook to the north. Willowdale is served by two TTC subway lines -- the Sheppard Line, with Willowdale stations at Yonge and Bayview, and the Yonge-University Spadina Line, with Willowdale stations at Finch and North York Centre. There are also 14 different connecting bus routes. The Willowdale neighbourhood consists of single family homes, condominium townhouses and high-rise condominium towers. The single family homes range in age from the original 1910 to 1950s construction (one and two-storey pre-war houses and modest one-and-half storey postwar houses). After the 1990s, very large replacement two-storey luxury homes were constructed by tearing down the original houses. Interested in Buying or Selling a Willowdale Property? We have extensive knowledge of the Willowdale community and can help answer all your questions about this well-established neighbourhood. Check also the Ridgegate neighbourhood which is a part of the Willowdale (North York) neighbourhood. Contact us to learn more about the neighbourhood and about the market conditions for selling or buying a home in the Willowdale community of Toronto.